How does it feel to live in space? Why astronauts can sometimes barely stand on their feet, how to cope with hunger in space and how not to go blind while in orbit: insights from Russian scientists on a one-year endurance mission to ISS. A one-year endurance mission launched to ISS on March 27, 2015 will involve 19 medical and biological tests, with 14 of them planned by the Russian Space Agency. Cosmonaut Mikhail Kornienko and NASA’s Scott Kelly will also undertake two experiments together. Most of the tests will be used by scientists to determine the ability of the human body to withstand long-duration spaceflight in preparation for a mission to Mars. As several tests showed before, weightlessness affects eating habits. As food weighs nothing in space, astronauts get hungry with much greater frequency than they do on Earth. According to Boris Afonin, the scientific supervisor of the food tests, the increased appetite combined with low amounts of physical activity can sometimes lead to weight gain. Space food: What do cosmonauts eat? Nevertheless, according to Afonin, all of the above is just a general assumption, and the test he supervises will determine which parts of the human gastrointestinal tract are affected the most, as well as if there is a risk of pathological changes. The data will be used to work out the means to prevent any harmful changes in the digestive system to create an optimal diet for astronauts. 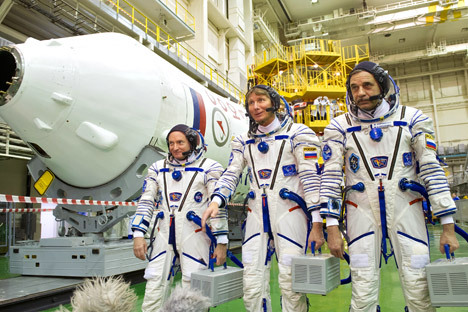 The Russian scientists involved in the mission will also monitor Mikhail Kornienko’s metabolism. Every two months the cosmonaut will fill out questionnaires on water and food consumption, take blood samples and be screened on a special device called “Sprut” (squid in Russian). The data is expected to help scientists determine how weightlessness affects human immune and endocrine systems. “Even small changes in the endocrine profile may have an impact on the performance of an astronaut,” explains Galina Vasilieva, chief researcher at the Institute of Biomedical Problems of the Russian Academy of Sciences. Once astronauts come back to Earth, much of what has occurred is reversed: gravity kicks in, and blood is rather abruptly pulled back to the lower part of the body, which is why astronauts have some difficulties standing on their feet after landing. The tests performed by the Russian team will help to facilitate and accelerate the adaptation to the conditions of both space and Earth. Another test is dubbed “Udod” (hoopoe in Russian, a type of colorful bird). The first of its kind to be performed during periods of weightlessness, the test studies the impact of fluid redistribution on the respiratory system and eyesight. The increased blood flow in the upper part of the body causes intracranial pressure to rise. This might be one of the causes of eyesight deterioration, which some astronauts have reported. The experience is akin to hanging upside down.